Are secret courts one step closer? 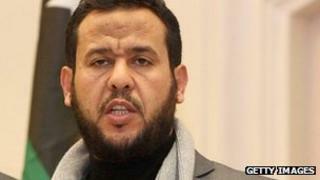 Image caption Abdul Hakim Belhadj: Will the Libyan rendition claims be heard in secret sessions under new law? The government's battle to introduce more secrecy to British courts returns to Parliament on Wednesday - but after a series of heavy defeats for ministers over the issue, are they, in fact, actually winning? By the end of Wednesday, one of the most controversial pieces of legislation in recent years is expected to be halfway to becoming law. The government's Justice and Security Bill has its Third Reading in the House of Lords, before it passes next door to be considered by MPs. The Bill's main purpose is to create a mechanism that allows court doors to close and evidence to be heard in secret where the government says it needs to keep information from the public, on grounds of national security. This power already exists, but it can only be used in a limited number of circumstances, largely relating to when government lawyers are presenting to judges a secret MI5 assessment about a terrorism suspect. The Justice and Security Bill expands the principle across all of the civil courts and it would allow the government to rely on a secret defence where it is the target of legal action - such as if it were being sued for alleged wrongdoing committed by MI5 or MI6. Ministers and Whitehall security chiefs say the legislation is necessary to allow the government to be able to adequately defend itself in cases where it believes it cannot do so in open court. To do so would be to risk exposing information that the public expects it to keep secret in the name of national security. This may not necessarily be the particular facts of a case - but rather information that gives away how the secret intelligence and security services work. In these cases, there would still be a public judgement - but there would also be a closed secret judgement which would contain the full reasoning why the government won or lost the case. Critics, including much of the legal world, say that secret court sessions, known in the jargon as a "Closed Material Procedure" (CMP), may assist secret agencies to defend themselves - but they would no longer allow someone who alleges wrongdoing to get a fair hearing. That's because the individual wouldn't be present in the hearings to challenge what is being said. They would have a security-vetted lawyer representing them - you can read more about how the system works in this earlier blog. So given the substantial opposition outside of Parliament, is the government getting its way? Last week, peers made three changes to the bill ahead of Wednesday's Third Reading. The key change was that peers voted to put the power to authorise closed hearings in the hands of a judge, taking it away from ministers. They also said that judges would have a duty to balance claims of what is good for national security with claims of what is good for justice. Finally, peers forced through an amendment that would allow either party to ask for CMP, not just ministers. All of these made bad headlines for the government and talk of coalition rifts. But core purpose of the bill - more use of secret evidence sessions - still stands. The amendments that passed introduce some procedural changes to how CMP would be triggered and used - but the attempts to wreck the bill completely failed. It is deeply distressing to me and to my former colleagues to be accused of really wicked iniquities in the case of torture and maltreatment. We have not been able to defend ourselves. The closed material procedure gives the opportunity for this material... to be looked at. Labour's position became clear in the Lords debate. It appears prepared to support the bill through to law, providing there are amendments which it says benefit justice. But one of the harshest critics during the debate was Lord Macdonald, the former Director of Public Prosecutions. He told peers that if CMP were expanded, the damage would be to justice itself. On the other hand, the former security minister Baroness Pauline Neville-Jones argued that justice is damaged by failing to provide the government with a means of getting a fair hearing. Who's right? Well - this is the tricky part. There are said to be some 20-odd cases in which the government feels it cannot adequately defend itself at the moment because it cannot put its defence into open court. David Anderson QC, the terror laws watchdog, has seen material relating to three cases and concluded that CMP could be tolerable as a last resort, if there was no other fair way of ruling on them. But the Special Advocates, the security-vetted lawyers asked to act in secret cases where they already exist, don't know the full list because the Home Secretary won't tell them what it is. They say in the absence of this basic information, the government has not made a case for the Justice and Security Bill. The very people who will be charged with acting in these new cases remain unconvinced. So that's the problem as the bill goes on. A compelling argument from government that it is trying to defend itself with one hand tied behind its back - and a compelling argument against meddling with open justice. Will the bill get through? Some of its sternest critics believe the government will get its way in the New Year. The first big test may come soon afterwards, with the looming legal action by former Libyan dissidents who say the UK helped to organise their kidnap and transfer to Colonel Gaddafi's regime.